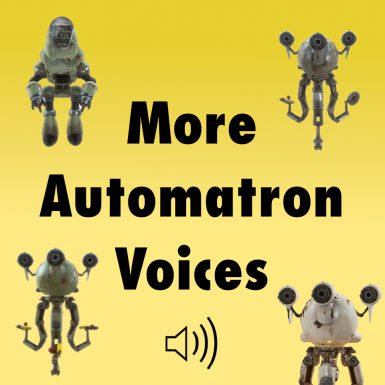 Adds several new voice types for Automatron robots, including Mr. Handy, Mr. Gutsy, Miss Nanny, Protectron, and just for fun...Professor Goodfeels and Takahashi. If you're like me, you were very disappointed that the Automatron DLC was missing several voice types for robots in the game. We can build a Protectron and a Mister Handy, but not give them the proper voices? What gives, Bethesda? The robots can be used as companions just like any other automatron, and have the necessary response dialogue. However, do keep in mind that if you have subtitles turned on, they will not always match what the robot actually says. This is because Bethesda made all robot companions share the same dialogue lines, so there was no way for me to individually edit the subtitles for each voice type. You could always turn off subtitles if this mismatch bothers you, but it shouldn't be an issue really. If anything, it lets you know what the "real" dialogue is, which comes in handy for the Professor Goodfeels and Takahashi voices. I tried to make the dialogue match the subtitles as closely as possible, though. With the Protectron voice, I lucked out and was able to find quite a bit of voice files that almost exactly match. But for other robots, I just had to go with lines that mean something similar to what the subtitles say. So it won't feel quite as fluid and intuitive as the default voices, but it's still an improvement over no voices at all! 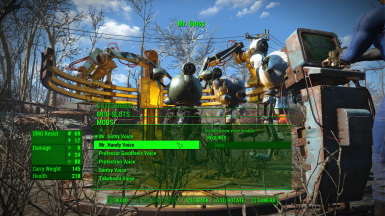 And yes, I know there's another mod out there that adds more robot voices, but it was abandoned a couple years ago and never got out of the work-in-progress stage. This mod is fully complete.